When looking for the best girl’s mountain bike, I started to research bikes for my daughter. It was her 12th birthday and I wanted her to have a nice ride. She had been riding alongside me on backcountry trails for several years and I hoped to surprise her with a new mountain bike. 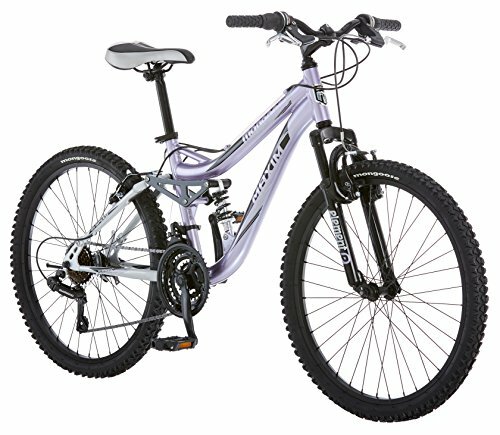 My top choice for best girl’s mountain bike was and is the Diamondback Girls’ Tess 24 in Mountain Bicycle. Diamondback has earned their reputation as a premier mountain bike manufacturer. A mountain bike lets any child sail across gravel roads, overexposed roots, through mud, and across the uneven ground with ease. Undoubtedly, riding any of the bikes listed here will definitely put a smile on any girl’s face. Please take a moment to read about each choice and choose whichever ride will best fit your child’s unique needs. The Diamondback Girls’ Tess 24 in Mountain Bicycle features a Shimano 21-speed controller for up and downhill shifting. The 24-inch wheels maneuver effortlessly across rough terrain. Also, the steel handlebars and DB Kraton grips allow any girl to remain in control while riding. The strong alloy brakes stop quick for optimum safety so riding fast or downhill isn’t as scary. 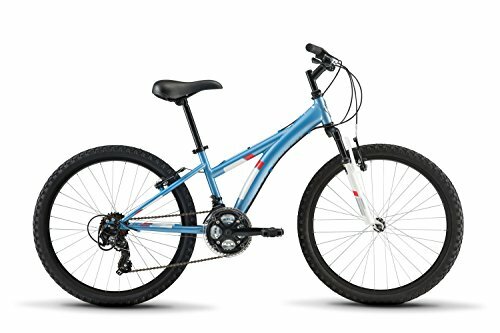 Diamondback recommends the Diamondback Girls’ Tess 24 in Mountain Bicycle for children ages 8 to 12 years measuring 53 – 62 inches tall with a maximum weight of up to 300 pounds. The steel frame of the Diamondback Girls’ Tess 24 in Mountain Bicycle stands up to daily riding. The 2-panel seat also affords optimum comfort, so your child doesn’t become saddlesore when offroading. When considering a mountain bike for your child, you should definitely take a look at the Mongoose R3577 Girl’s Maxim Full Suspension Bicycle. This runner-up choice for best girl’s mountain bike will not disappoint. The bike looks good and rides fantastic. The full suspension frame bears close similarities to high-end adult mountain bikes. With a suspension frame and front suspension fork, the bike flies across a wide variety of terrain. A girl always remains in control while riding the Mongoose R3577 Girl’s Maxim Full Suspension Bicycle (24-Inch). The bike has Shimano gearing and SRAM twist shifters. The alloy linear pull brakes stop quickly and efficiently even on slippery gravel. Also, the 3-piece mountain crank wide gear ranges let the child choose the gear that works best for the terrain. The aluminum and steel construction of the Mongoose R3577 Girl’s Maxim Full Suspension Bicycle (24-Inch) offers durability but also lightweight enough to easily load onto a bike rack. Initially, mountain bikes were only hardtails, especially those designed for youth riders. However, times are changing. Nowadays, a kid can also ride in comfort on a full suspension bike without breaking the bank. The Mongoose R3577 Girl’s Maxim Full Suspension Bicycle (24-Inch) glides across rough terrain without missing a beat so the child won’t experience bone-jarring or saddle-soreness. Many people instantly think, ‘hardtail’ whenever they consider a mountain bike. Undoubtedly, a hardtail rarely disappoints on the backcountry. The 20″ Huffy Summit Ridge 6-Speed Hardtail Mountain Bike returns to the basics with its design and style. The bike has six speeds with an indexed Shimano TX-31 rear derailleur. The micro-shifter works great for uphill climbing or a rapid downhill descent. The removable rear derailleur guard guarantees consistent gear operation. 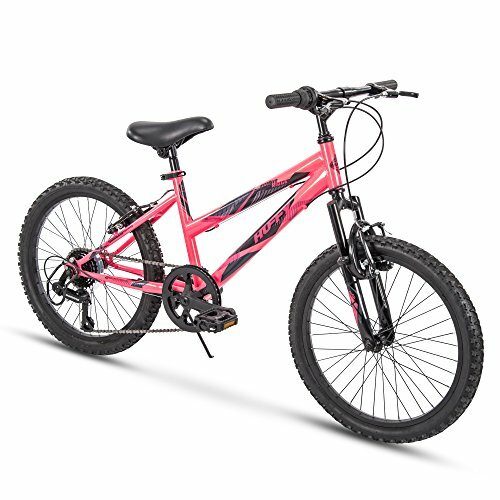 Most little girls fall in love with the hot-pink, glossy paint job of the 20″ Huffy Summit Ridge 6-Speed Hardtail Mountain Bike. Although many old-school riders might expect a hardtail to produce a rough ride, the Kolo 1200 suspension fork smooths out the trail by effectively absorbing the bumps. The 20″ x 1.95″ ATB tires handle pavement easily transition from pavement to dirt to gravel. When sailing across an off-road trail, the linear pull hand brakes deliver consistently stopping power for a safe and stress-free ride. The 20″ Huffy Summit Ridge 6-Speed Hardtail Mountain Bike design of the lets the rider ride in an upright position so they minimize back and shoulder strain. Also, the ABT-type resin pedals offer maximum push power. Also, the Krayton grips fit a child’s hands perfectly. The kickstand keeps the bike in an upright position when not in use. 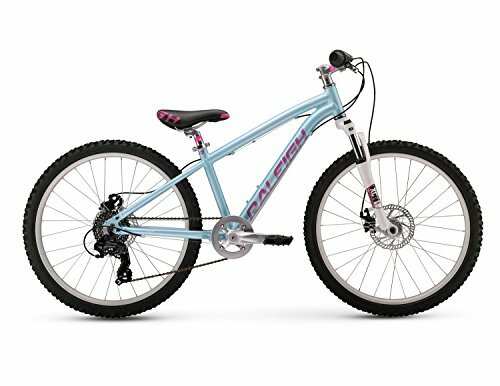 The Raleigh Bikes Raleigh Eva 24 Girl’s Mountain Bike has been specially designed for girls ages 8 to 12. Undoubtedly, the bike makes an excellent first-timer off-roader rider. Little girls love this bike because it looks just like an adult version. Although, a mountain bike, the Eva 24 performs well on pavement, too. The lightweight aluminum frame makes loading and unloading this bike onto a bike rack effortless. The bike weighs in at only 27 pounds. The cushioned seat of the Raleigh Bikes Raleigh Eva 24 Girl’s Mountain Bike prevents fatigue and soreness after an all-day ride. The Junior Soft PVC grips also let little hands easily control the bike across bumpy off-road trails. The bike has seven gears for climbing and descent. The multi-use tires effortlessly grip the trail’s surface even in slippery mud. If you are seeking the best girl’s mountain bike that is going to last for innumerable years then you won’t be disappointed with the Raleigh Bikes Raleigh Eva 24 Girl’s Mountain Bike. Without a doubt, the bike can stand up to serious off-road abuse while still offering a great ride. 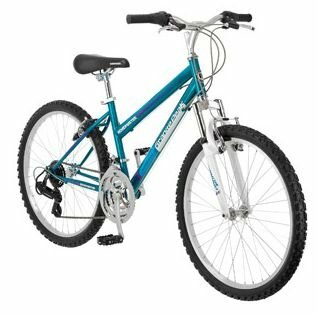 Fashioned from an all steel frame, the Roadmaster Granite Peak 24″ Girls Mountain Bike (Teal)is highly durable. The bike’s front suspension fork helps absorb the bumps of the road to create a smoother ride. Certainly, the twist shifters let a child feel in charge of the ride by allowing smooth transition shifting through the 18 gears. The bike’s Shimano rear derailleur also creates shifting smoothness. With the 3-piece mountain crank, the child can choose the necessary gear for the terrain. 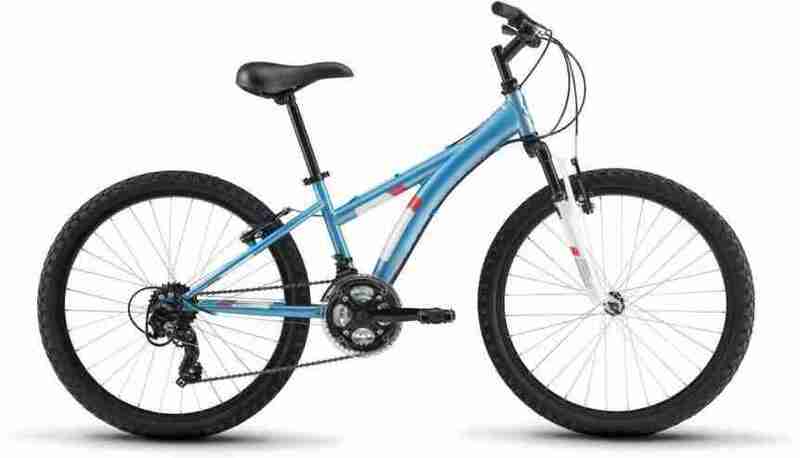 The entire design of the Roadmaster Granite Peak 24″ Girls Mountain Bike (Teal) won’t disappoint if you are seeking an affordable girl’s mountain bike that performs. The bike also comes equipped with alloy wheels for control and added durability off-road. A child can easily transition from pavement to offroad riding on this bike. When choosing the best girl’s mountain bike, it is all about the fit. Many parents are tempted to purchase a larger bike for their child to grow into. However, bigger bikes pose safety problems. A child’s feet may not reach the ground. Also, larger handlebars make squeezing the brakes quickly difficult. If the child cannot effortlessly control the bike then they risk crashing and possible injury. Stand-Over Height: Make sure your child can straddle the bike with both feet flat on the ground. Seat Height: Yes, both seats are adjustable. Ideally, the balls of the child’s feet should touch the ground while they are seated on top of the saddle. Reach: The child must comfortably reach the handlebars. Ideally, their elbows must appear slightly bent as their hands grasp the grips and their remain fully seated in the saddle. It goes without saying that the child must effortlessly control the handbrakes from a seated position for optimum safety while riding. Sure you want to purchase a durable bike, but weight remains a factor. A girl might have a difficult time controlling a heavy bike as it sails up or down a trail. A lightweight design provides more manageability for a child. Steel construction might stand up to the years, but an aluminum frame offers more maneuverability and handling benefits. Sure, on pavement single speed bikes work fine. However, an off-road mountain bike requires gears. All of the climbs and descents of a backcountry trail require a gear range ratio for easy and safe riding. Some kids bikes have 27 gears which tend to be overkill because the numerous gears become confusing. Plus, the gears are added weight on the bike. Ideally, a child benefits from having seven to nine gears when riding off-road. However, if your child is an experienced mountain bike enthusiast then a higher gear ratio could prove beneficial. Kids have different skills when it comes to shifters. Some youngsters thrive with grip shifters and others can master the trigger shifter. If you are unsure of which one will work best for your child then stop into a bike shop to try out the different kids. Hardtail or full suspension? This is an age-old question even with adult mountain bike enthusiasts. With children, shocks often become unwanted weight because if the girl is lightweight then the front shock may not even compress. However, well-built mountain bikes take into consideration a child’s lightweight and design the shocks accordingly. Old-school coaster brakes let a child slow down or stop by back-pedaling. Many children feel secure with coaster brakes. However, on a mountain bike, coaster brakes create unwanted weight. Some manufacturers even combine coaster brakes with hand brakes. This combo is great if your child wants to transition from the coaster brake system to the handbrake. Once your child becomes confident with the handbrake, you can take the mountain bike to a bike shop and have the heavy caster brake system removed. Remember, most MTB’s have disc brakes for increased control and stopping power. When choosing the best girl’s mountain bike, any of the above choices will work. In my opinion, the Diamondback Girls’ Tess 24 in Mountain Bicycle stands out above the rest.